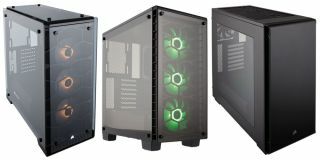 Corsair today announced three new computer cases featuring varying amounts of tempered glass to show off system builds. The three new enclosures culminate in the Crystal Series 570X RGB, an enclosure with four tempered glass panels for builders who are especially confident in their cable management skills. On the flip side, there's no hiding from crummy cable management in the 570X—builders who like to shove excess cables and wiring behind the motherboard tray will find that they might be out of the way, but certainly not out of sight. That's because the right-side tempered glass gives a full view of what's inside. The top, front, and left-side panels are made of tempered glass as well, each one held in place with thumb screws. Window cleaner is not included, though with the potential for fingerprints on four sides, builders who opt for the 570X RGB may want to keep a bottle close buy. The 570X RGB has room for up to six case fans and is compatible with 360mm, 280mm, and 120mm radiators. Three SP120 RGB fans are included. It also features removable fan trays in the front and top to make installation easy. Dedicated cable routing channels, covers, and included straps will help meticulous builders keep things looking tidy. Those will come in handy if filling all five drive bays (two 3.5-inch and three 2.5-inch). Finally, the top panel includes a built-in RGB lighting controller, headphone and microphone inputs, and two USB 3.0 ports. The Crystal Series 570X RGB has an MSRP of $180. Second up is the Crystal 460X RGB (also available without RGB lighting), a mid-tower ATX case with two tempered glass panels, one on each side. Like the 570X RGB, that means builders will want to spend some time cleaning up the mess of cables that typically take residence behind the motherboard tray. This one also comes with three SP120 RGB fans and a built-in three button controller. For liquid cooling, there's room for a 360mm, 280mm, or 240mm radiator in front or a 240mm up top. The 460X is essentially a less see-through version of the 570X. It supports up to two 3.5-inch hard drives and up to three 2.5-inch SSDs, also has dust filters on all intakes, and a front I/O panel that's identical to the 570X. What isn't the same is the price—the 460X RGB runs $140 MSRP, or $120 for the regular 460X with two included fans (red LED AF140L and a non-LED AF120L). The last of Corsair's new cases is the Carbide Series 270R. This one has just a single tempered glass side panel to show off the main system, leaving builders free to litter the area behind the motherboard. There's also a non-windowed version. Corsair includes two fans for the windowed version, a red LED AF120 120mm for the front intake and a black AF120 120mm for the rear exhaust. The non-windowed version doesn't include the exhaust. The compact chassis holds up to two 3.5-inch drives and up to two 2.5-inch drives, one less than either of the Crystal Series cases. However, it supports liquid cooling radiators up to 360mm and offers the same front I/O panel features, minus the integrated RGB controller. Corsair has set the MSRP to $70 for the 270R.